DHL is rolling out an all “green” fleet of commercial delivery vehicles in Manhattan to help reduce its impact on the city’s environment. 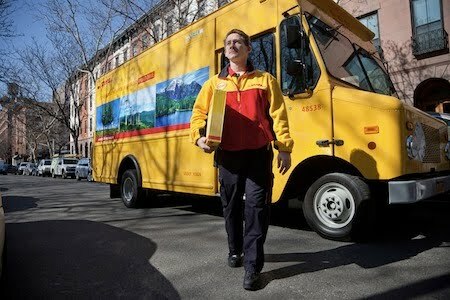 Frank Appel, Chief Executive Officer of Deutsche Post DHL, announced the company’s initiative in New York City as he presented the inaugural vehicles in the 80-vehicle fleet. By September 2011, DHL Express will operate 30 American-made, battery-powered electric vans and 50 hybrid trucks that will cut down fossil fuel use and in combination reduce CO2 emissions by more than 50 percent each year in comparison to conventional vehicles. The multi-million dollar investment in the modern, environmentally-friendly vehicles is an integral part of the Deutsche Post DHL Group’s global GoGreen strategy, which has the goal of improving the company’s carbon efficiency worldwide by 30 percent by 2020, compared to 2007 base levels. In a large international city like New York, this fleet investment, which dovetails with Mayor Michael R. Bloomberg’s comprehensive plan to lower carbon emissions throughout the city, allows DHL to serve customers with sustainable solutions and improved resource efficiency. The two types of green vehicles to be used in New York City by DHL Express are being manufactured in the U.S. by Azure Dynamics. The Balance Hybrid Electric vehicle components combine Azure’s hybrid powertrain with a Ford E450 chassis. By converting DHL’s existing Ford E450s into hybrids, the vehicle’s fuel economy will improve by up to 40 percent while emissions will be reduced by about 30 percent. Azure will also integrate its Force Drive electric powertrain into new Ford Transit Connect vans. Using an advanced lithium-ion battery, the van can achieve a range of up to 80 miles on a single charge and can be recharged overnight. The Transit Connect Electric is virtually silent, thus reducing exterior and interior noise, and has zero tailpipe emissions.